was born in 1989 in Tehran, Iran. she is an oud player and Her first teachers was master Mansour nariman and next Ali pajuheshgar. She graduated in girls music school of Tehran & now studying playing of Iranian musical instruments in music university of applied science and technology. she is a member of the iran public orchestra with leading of master Farhad fakhreddini Afterward she joined master Hengame akhavan's group called Bahar. 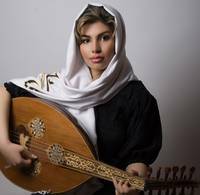 she had been teaching oud in music university of applied science and technology since 2006.